HINT: The vehicle's garage door opener records transmitter codes for systems such as garage doors, gates, entry gates, door locks, home lighting systems, security systems or other transmitter-code based systems. The garage door opener is built into the dome lamp No. 1. If replacing the dome lamp No. 1, transmitter codes for any systems previously registered in the garage door opener must be re-registered. (a) Re-register systems in the garage door opener registration mode. Do not perform transmitter code registration for a system if people or objects are near the system. When registering transmitter codes for a system, injury or damage can occur because the system may open, close, unlock or otherwise operate. Before transmitter code registration, stop the engine and remove the key from the ignition switch. The garage door opener cannot be used with systems that: 1) were manufactured before April 1, 1982; or 2) systems that do not meet Federal Safety Standards (for example, garage doors without a jam protection function). 3 transmitter codes can be registered with the garage door opener, one transmitter code for each of the 3 garage door opener switches. Disconnecting the battery will not erase the transmitter codes registered with the garage door opener. An attempt to overwrite a previously registered transmitter code with a new system's transmitter code may fail. In these situations, the previously registered transmitter code will not be erased. Select a garage door opener switch for transmitter code registration. Press and hold the selected switch for 20 seconds. The garage door opener will enter registration mode. HINT: Before entering registration mode, the LED is ON. 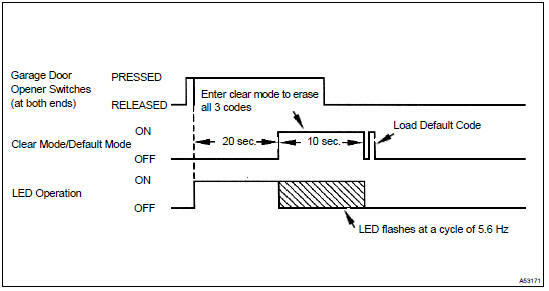 After entering registration mode, the LED flashes at a cycle of 1 Hz. For a "rolling code" type system, after entering registration mode, the LED flashes at a cycle of 8.8 Hz for 1.6 seconds, and then the LED flashes at a cycle of 1 Hz. After the garage door opener has entered registration mode, bring the original transmitter of the system to be registered within 1 to 3 inches of the garage door opener and press and hold one of the garage door opener switches. Then press the original transmitter switch. If the transmitter code registration was successful, the LED of the garage door opener flashes at a cycle of 5.6 Hz. If no malfunction occurs, release both the garage door opener switch and the original transmitter switch. If transmitter code registration fails: 1) the original transmitter's battery may be low or need to be replaced, or 2) the system to be registered may not be compatible with the garage door opener. Some transmitter's signals stop after 1 to 2 seconds. For these types of transmitters: 1) press and hold one of the garage door opener switches, and 2) press and release (cycle) the transmitter switch every 2 seconds. Check if the transmitter code was successfully registered. After entering the garage door opener registration mode, transmitter code registration must be completed within 90 seconds. If 90 seconds elapses, the garage door opener will enter low power mode (see step (c)). (b) Erase transmitter codes in the garage door opener clear mode. All 3 registered transmitter codes will be erased. No option exists for only erasing one transmitter code. If the switches are released within 10 seconds after the transmitter codes have been erased, the garage door opener will enter registration mode. If the switches are held for 10 seconds or more after the transmitter codes have been erased, default codes will be set to the 3 switches of the garage door opener. Using these default codes, operation of the garage door opener can be checked using a tester. Press and hold the left and right switch of the garage door opener for 20 seconds. 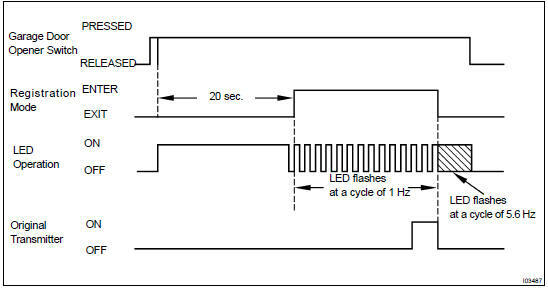 The LED will begin to flash at a cycle of 5.6 Hz. Releasing the switches will end clear mode. If a garage door opener switch is held for 75 seconds or more, the garage door opener will enter low power mode to economize on power consumption. When the garage door opener has entered low power mode, the LED turns off.